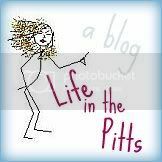 Life in the Pitts: Casting stones- at myself. Definitely free flow, makes it more fun to read :) You are a awesome blogger. I like it the way it is. You could always do a craft blog too and just link the two together. I have that and Christy has that too. I like hearing about your life though so definately keep posting your daily antics. Are you kidding me?! ALL of your posts are worth reading. I would know, I've read all of them. You're such a good writer, and it's always fun to read your blog.Don't change it. Don't change a thing..you make me smile and laugh.